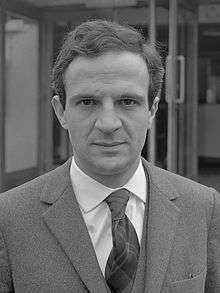 François Roland Truffaut (French: [fʁɑ̃.swa ʁɔ.lɑ̃ tʁyfo]; 6 February 1932 – 21 October 1984) was a French film director, screenwriter, producer, actor, and film critic, as well as one of the founders of the French New Wave. In a film career lasting over a quarter of a century, he remains an icon of the French film industry, having worked on over 25 films. Truffaut's film The 400 Blows came to be a defining film of the French New Wave movement. He also directed such classics as Shoot the Piano Player (1960), Jules et Jim (1961), The Wild Child (1970), Two English Girls (1971), Day for Night (1973) and The Woman Next Door (1981). Truffaut was born in Paris on 6 February 1932. His mother was Janine de Montferrand. His mother's future husband, Roland Truffaut, accepted him as an adopted son and gave him his surname. He was passed around to live with various nannies and his grandmother for a number of years. It was his grandmother who instilled in him her love of books and music. He lived with his grandmother until her death when Truffaut was eight years old. It was only after his grandmother's death that he lived with his parents for the first time. The identity of Truffaut's biological father was unknown, though a private detective agency in 1968 revealed that their inquiry into the matter led to a Roland Levy, a Jewish dentist from Bayonne. Truffaut's mother's family disputed the findings but Truffaut himself believed and embraced them. Truffaut joined the French Army in 1950, aged 18, but spent the next two years trying to escape. Truffaut was arrested for attempting to desert the army. Bazin used his various political contacts to get Truffaut released and set him up with a job at his newly formed film magazine Cahiers du cinéma. Over the next few years, Truffaut became a critic (and later editor) at Cahiers, where he became notorious for his brutal, unforgiving reviews. He was called "The Gravedigger of French Cinema" and was the only French critic not invited to the Cannes Film Festival in 1958. He supported Bazin in the development of one of the most influential theories of cinema itself, the auteur theory. In 1954, Truffaut wrote an article called "Une Certaine Tendance du Cinéma Français" ("A Certain Trend of French Cinema"), in which he attacked the current state of French films, lambasting certain screenwriters and producers. The article resulted in a storm of controversy. Truffaut later devised the auteur theory, which stated that the director was the "author" of his work; that great directors such as Renoir or Hitchcock have distinct styles and themes that permeate all of their films. Although his theory was not widely accepted then, it gained some support in the 1960s from American critic Andrew Sarris. In 1967, Truffaut published his book-length interview of Hitchcock, Hitchcock/Truffaut (New York: Simon and Schuster). After having been a critic, Truffaut decided to make films of his own. He started out with the short film Une Visite in 1955 and followed that up with Les Mistons in 1957. After seeing Orson Welles' Touch of Evil at the Expo 58, he was inspired to make his feature film debut in 1959 with Les Quatre Cents Coups (The 400 Blows). This film was an instant success and won him a prize at the Cannes Film Festival. This film and the following films were successful even with the low budget he had to make the films. Truffaut was married to Madeleine Morgenstern from 1957 to 1965, and they had two daughters, Laura (born 1959) and Eva (born 1961). Madeleine was the daughter of Ignace Morgenstern, managing director of one of France's largest film distribution companies, and was largely responsible for securing funding for Truffaut's first films. He had affairs with many of his leading ladies: in 1968 he was engaged to actress Claude Jade; Truffaut and actress Fanny Ardant lived together from 1981 to 1984 and had a daughter, Joséphine Truffaut (born 28 September 1983). Truffaut was an atheist. In July 1983, Truffaut rented France Gall and Michel Berger's house outside Honfleur, Normandy (composing for Philippe Labro's film, Rive droite, rive gauche) when he had a first stroke and was diagnosed with a brain tumor. He was expected to attend his friend Miloš Forman's Amadeus premiere when he died on 21 October 1984, aged 52, at the American Hospital in Neuilly-sur-Seine in France. At the time of his death, he still had numerous films in preparation. His goal was to make 30 films and then retire to write books for his remaining days. He was five films short of his personal goal. He is buried in Paris' Montmartre Cemetery. The 400 Blows was released in 1959 to much critical and commercial acclaim. Truffaut received a Best Director award from the Cannes Film Festival, the same festival that had banned him only one year earlier. The film follows the character of Antoine Doinel through his perilous misadventures in school, an unhappy home life and later reform school. The film is highly autobiographical. Both Truffaut and Doinel were only children of loveless marriages; they both committed petty crimes of theft and truancy from the military. Truffaut cast Jean-Pierre Léaud as Antoine Doinel. Léaud was seen as an ordinary boy of 14 who auditioned for the role after seeing a flyer, but interviews filmed after the film's release (one is included on the Criterion DVD of the film) reveal Léaud's natural sophistication and an instinctive understanding of acting for the camera. Léaud and Truffaut collaborated on several films over the years. Their most noteworthy collaboration was the continuation of the Antoine Doinel character in a series of films called "The Antoine Doinel Cycle". Although he was legally accepted as a legitimate child, his parents did not accept him. The Truffauts had another child who died shortly after birth. This experience saddened them greatly and as a result they despised François because of the memory of regret that he represented (Knopf 4). He was an outcast from his earliest years, dismissed as an unwanted child. François was sent to live with his grandparents. It wasn't until François's grandmother's death before his parents took him in, much to the dismay of his own mother. The experiences with his mother were harsh. He recalled being treated badly by her but he found comfort in his father's laughter and overall spirit. The relationship with Roland was more comforting than the one with his own mother. François had a very depressing childhood after moving in with his parents. They would leave him alone whenever they would go on vacations. He even recalled memories of being alone during Christmas. Being left alone forced François into a sense of independence, he would often do various tasks around the house in order to improve it such as painting or changing the electric outlets. Sadly, these kind gestures often resulted in a catastrophic event causing him to get scolded by his mother. His father would mostly laugh them off. Following the success of The 400 Blows, Truffaut featured disjunctive editing and seemingly random voice-overs in his next film Shoot the Piano Player (1960) starring Charles Aznavour. Truffaut has stated that in the middle of filming, he realized that he hated gangsters. But since gangsters were a main part of the story, he toned up the comical aspect of the characters and made the movie more attuned to his liking. Even though Shoot the Piano Player was much appreciated by critics, it performed poorly at the box office. While the film focused on two of the French New Wave's favorite elements, American film noir and themselves, Truffaut never again experimented as heavily. In 1962, Truffaut directed his third movie, Jules and Jim, a romantic drama starring Jeanne Moreau. Over the next decade, Truffaut had varying degrees of success with his films. In 1963, Truffaut was approached to direct an American film called Bonnie and Clyde, with a treatment written by Esquire journalists, David Newman and Robert Benton intended to introduce the French New Wave to Hollywood. Although he was interested enough to help in script development, Truffaut ultimately declined, but not before interesting Jean-Luc Godard and American actor and would be producer, Warren Beatty, the latter of whom proceeded with the film with director Arthur Penn. As for Truffaut, his first non-French film was an 1966 adaptation of Ray Bradbury's classic science fiction novel Fahrenheit 451, showcasing Truffaut's love of books. His only English-speaking film was a great challenge for Truffaut, because he barely spoke English himself. This was also his first film shot in color. The larger scale production was difficult for Truffaut, who had worked only with small crews and budgets. Truffaut worked on projects with varied subjects. The Bride Wore Black (1968), a brutal tale of revenge, is a stylish homage to the films of Alfred Hitchcock (once again starring Jeanne Moreau). Mississippi Mermaid (1969), with Catherine Deneuve, is an identity-bending romantic thriller. Stolen Kisses (1968) and Bed and Board (1970) are continuations of the Antoine Doinel Cycle. And The Wild Child (1970) included Truffaut's acting debut in the lead role of 18th century physician Jean Marc Gaspard Itard. In 1975, Truffaut gained more notoriety with The Story of Adele H. Isabelle Adjani in the title role earned a nomination for a Best Actress Oscar. Truffaut's 1976 film Small Change gained a Golden Globe Nomination for Best Foreign Film. Truffaut's other films were from original screenplays, often co-written by the screenwriters Suzanne Schiffman or Jean Gruault. They featured diverse subjects, the sombre The Story of Adele H., inspired by the life of the daughter of Victor Hugo, with Isabelle Adjani; Day for Night, shot at the Studio La Victorine describing the ups and downs of film-making; and The Last Metro, set during the German occupation of France, a film rewarded by ten César Awards. Truffaut expressed his admiration for filmmakers such as Luis Buñuel, Ingmar Bergman, Robert Bresson, Roberto Rossellini, and Alfred Hitchcock. Truffaut wrote a book about Hitchcock, based on a lengthy series of interviews. He once called German New Wave filmmaker Werner Herzog "the most important film director alive". 1976 Small Change L'Argent de poche Called Pocket Money in English-speaking countries outside North America. Entered into the 26th Berlin International Film Festival. 1977 The Man Who Loved Women L'Homme qui aimait les femmes Entered into the 27th Berlin International Film Festival. 1979 Love on the Run L'Amour en fuite Antoine Doinel series, entered into the 29th Berlin International Film Festival. 1 2 3 "FRANCOIS TRUFFAUT – French New Wave Director". Newwavefilm.com. Retrieved 6 February 2012. ↑ François Truffaut: film author 1932–1984 – Robert Ingram, Paul Duncan. Google Books. Retrieved 6 February 2012. 1 2 "François Truffaut – Movie and Film Biography and Filmography". Allmovie.com. 21 October 1984. Retrieved 6 February 2012. ↑ Truffaut, François (1989). Correspondence, 1945–1984. New York: Farrar, Straus and Giroux. pp. 17, 50, 57. ↑ SUKHDEV SANDHU (2 April 2009). "Film as an act of love". New Statesman. ↑ "Francois Truffaut". François Truffaut. Retrieved 6 February 2012. ↑ Eric Pace (22 October 1984). "Francois Truffaut, New Wave Director, Dies". New York Times. Retrieved 1 May 2013. Mr. Truffaut's 1957 marriage to Madeleine Morgenstern ended in divorce. He is survived by two adult daughters from that marriage, Laura Truffaut-Wong of San Francisco and Eva Truffaut of Paris, and by a 13-month-old daughter, Josephine. ↑ Eric Michael Mazur (2011). Encyclopedia of Religion and Film. ABC-CLIO. p. 438. ISBN 9780313330728. Yet Truffaut, an atheist, was not stumping for God with these conservative attacks. ↑ David Sterritt (1999). The Films of Jean-Luc Godard: Seeing the Invisible. Cambridge University Press. p. 17. ISBN 9780521589710. One way of understanding Godard's approach is to contrast it with that of François Truffaut, one of his most respected New Wave colleagues. As a self-described atheist, Truffaut took special pleasure in the materiality of cinema, noting that no photographic image can be obtained without real, physical light making direct contact with a real, physical object in the immediate presence of the camera. ↑ "Truffaut : un classique (1970-80)". francetv.fr. Retrieved 14 March 2016. ↑ "Francois Truffaut, New Wave Director, Dies". New York Times. 22 October 1984. Retrieved 26 May 2011. François Truffaut, the exuberant film director whose depictions of children, women and romantic obsessions helped make him a leader of the New Wave group of French movie makers, died yesterday. He was 52 years old. Mr. Truffaut died at the American Hospital in Neuilly-sur-Seine, a Paris suburb, a hospital spokesman said. He had been hospitalized about 10 days ago for treatment of cancer. 1 2 3 "The 47th Academy Awards (1975) Nominees and Winners". oscars.org. Retrieved 10 January 2012. ↑ François Truffaut. "Hitchcock". Goodreads. Retrieved 14 March 2016. ↑ Gleiberman, Owen. "Godard and Truffaut: Their spiky, complex friendship is its own great story in 'Two in the Wave". ↑ "The 32nd Academy Awards (1960) Nominees and Winners". oscars.org. Retrieved 15 November 2011. ↑ "The 41st Academy Awards (1969) Nominees and Winners". oscars.org. Retrieved 15 November 2011. ↑ "IMDB.com: Awards for Small Change". imdb.com. Retrieved 16 July 2010. ↑ "IMDB.com: Awards for The Man Who Loved Women". imdb.com. Retrieved 25 July 2010. ↑ "IMDB.com: Awards for Love on the Run". imdb.com. Retrieved 14 August 2010. ↑ "The 53rd Academy Awards (1981) Nominees and Winners". oscars.org. Retrieved 8 June 2013.